Atal Pension Yojana (APY) – All details and Tax Benefits with contribution calculator. Atal Pension Yojana (APY) is a pension scheme introduced by Government of India, for citizens of India. This scheme is mainly intended to address the pension needs of the unorganised working sector. As per the NSSO survey 2010 – 11 this sector contributes to the 88% of the labour force in India. Previous pension scheme targeting this sector – Swavalamban – is considered inadequate to cater the pension needs of this sector mainly due to the lack of guaranteed pension benefits at the age of 60. Atal Pension Yojana (APY) – Key features. A guaranteed minimum pension of Rs. 1000, 2000, 3000, 4000, and 5000 per month will be given at the age of 60 years depending on the contributions made by the subscribers. Any Indian citizen who have a bank account and the age is between 18 and 40 years shall be eligible for this scheme. Government co- Contribution along with the subscriber is available only for customers who joined the scheme during the period from 1 st June 2015 to 31 st December 2015. Other mandatory conditions that should satisfy are (1) the subscriber should not be an income tax payer. (2) The subscriber should not be a member of any statuary social security scheme. The period of co-contribution will be for five years only and the contributed amount will be 50% of the total contribution or Rs.1000 per annum which ever is less. The Government contribution will be credited to the subscribers Savings Bank account. Atal Pension Yojana (APY) – Contribution and Benefit Calculator. Calculate the monthly contribution amount required and benefits obtained for you easily using the calculator provided here. Click on the button provided below to open Atal Pension Yojana (APY) – Contribution and Benefit Calculator. 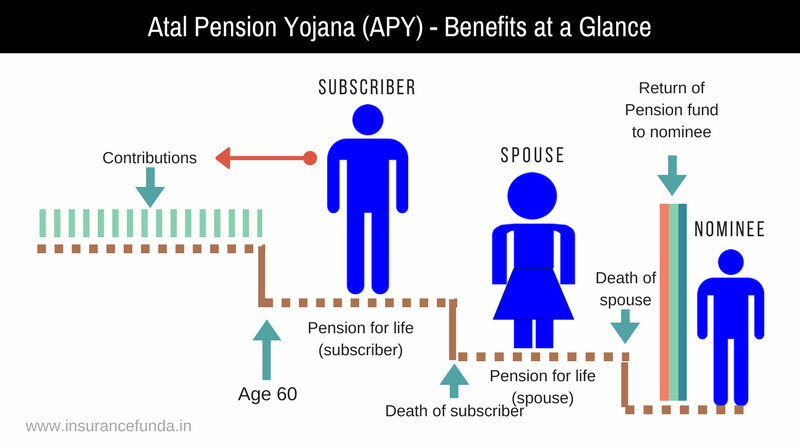 Atal Pension Yojana (APY) – Pension and Other Benefits . Upon completion of 60 years of age the subscriber can submit a request to the associated bank for drawing guaranteed monthly pension. The benefits will be as follows. Pension for life for the subscriber. Upon the death of the subscriber, pension for life will be available for the spouse. Upon the death of both subscriber and spouse, pension wealth will be paid to the nominee. Atal Pension Yojana (APY) – Income tax benefits. Contributions to the Atal Pension Yojana (APY) is now be eligible for the same tax benefits as the National Pension System (NPS), according to a circular released by the Income Tax department. The tax benefits include the additional deduction of Rs 50,000 under section 80CCD(1) introduced couple of years back. Atal Pension Yojana (APY)- Other Social security scheme beneficiaries who are not eligible. Jammu Kashmir Employees’ Provident Fund and Miscellaneous Provision Act,1961. Provide the Bank A/c number/ Post office savings bank account number and with the help of the Bank staff, fill up the APY registration form. Provide Aadhaar and Mobile Number. This is not mandatory, but may be provided to facilitate the communication regarding contribution. Ensure keeping the required balance in the savings bank account/ post office savings bank account for transfer of monthly / quarterly / half yearly contribution. Subscriber may increase or decrease the contribution once in a year during the month of April. If continuous default is there for a period of 6 months the account will be frozen and after 12 months account will be closed. Defaulters are liable for a fine which will vary from minimum of Rs 1 to 10 per month as shown below. The existing Swavalamban subscribers , between 18 and 40 years of age will be automatically migrated to APY with an option to continue under swavalamban scheme. Existing swavalamban customers who migrate to APY will be given govt contribution for a maximum of 5 years including swavalamban tenure.